Found for sale on eBay is a 1981 Eagle bus that’s been turned into an RV, and that houses a chopped-up 1972 Honda Z600 Kei Car. It’s the ultimate Japanese Kei Car escape pod for when your bus breaks down or is attacked by zombies. What’s great is that this bus has been converted into an RV, so you can live out of the thing, go on awesome road trips, and once you’ve arrived, just yank the little Honda out, and prepare to enjoy the beautiful roads around Mt. Rushmore or Pikes Peak or wherever people go in RVs. Apparently the bus has been lengthened from 40 to 45 feet, widened from 96 to 102 inches, and its roof has been elevated by nine inches to make it better at RV-ing. It has a giant 220 gallon fuel tank, a 140 gallon fresh water tank, two heat pumps on the roof, cabinets inside, blinds, a dishwasher, a clothing washer and drier, a fridge, a big TV, a tub, a shower, and a four cylinder Kubota diesel generator. It’s basically a house on wheels, which I guess is the whole point of an RV isn’t it? The seller, who’s also a supplier for Z600 replacement parts, claims that a “factory rebuilt” Detroit Diesel 8V92 crate engine was bolted in about 20 years and 95,000 miles ago, so this bus should have many miles ahead of it before it needs an overhaul. More importantly, that little Honda Z600 can be purchased (assuming this thing goes on sale again) for $5,500 in addition to the bus’s $39,900 asking price. 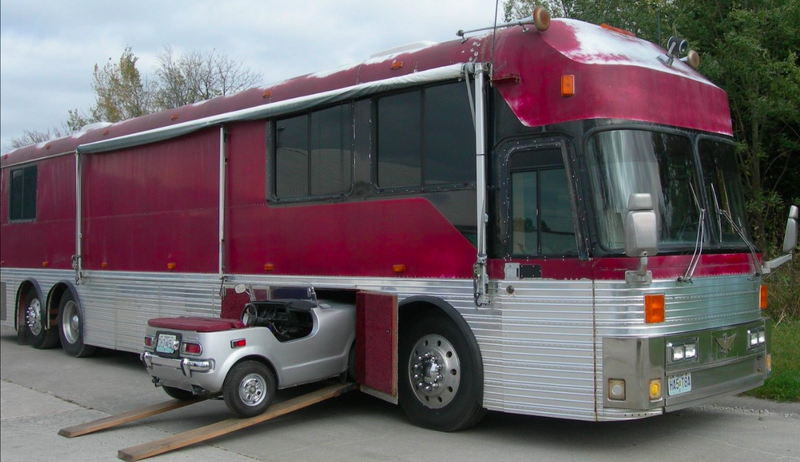 Lots of people like to flat-tow vehicles behind RVs so they can drive around their destination in something that isn’t the length of a humpback whale, but is that really as cool as having a vehicle built into your RV? Especially when that vehicle is something as wacky as an air-cooled Honda Z600?